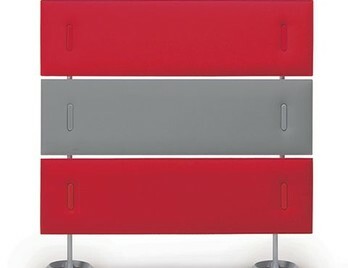 BuzziScreen is a more contemporary version of the traditional flexible room divider with more advantages. If you need to add or extend to the configuration you can add panels which link with a handy industrial zipper system making BuzziScreen a very flexible solution for reconfiguration or relocation. BuzziScreen, like other BuzziSpace products, allows you to pin objects, photos, or letters to the screen's surface. 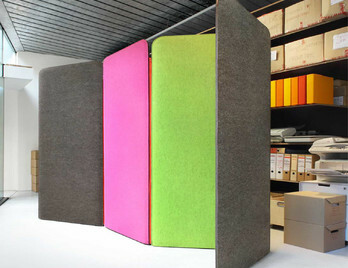 The absorbent divider consists of a sound-absorbent panel, covered with a laminated felt cloth on both sides. 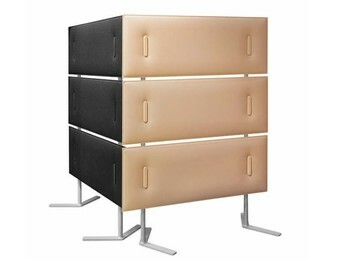 The modern day office does not stay still and furniture often needs to be moved and reconfigured. Plaid is easy to move yet does not look lightweight or flimsy due to it's carefully crafted design and production method. Plaid is an exciting product which challenges the more traditional screen solutions as it can be freestanding or suspended from the ceiling. 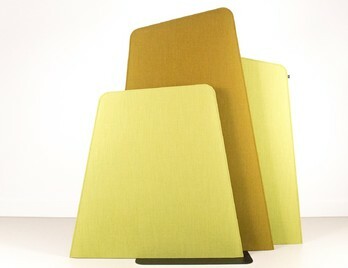 Cosy Panel is soft in both looks and material and has excellent absorbing qualities. 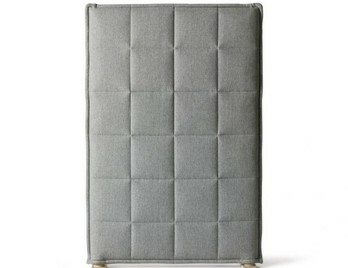 The screen consists of a sound-absorbent filling, within a solid wooden frame. The stitching gives the screen a friendly and welcoming expression which means it would work well at home as well as the office. 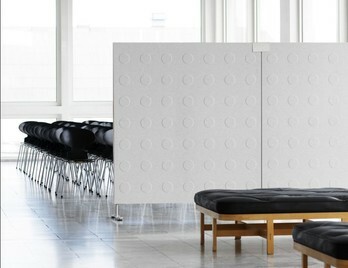 Mitesco Divider Panel is an aesthetically pleasing acoustic divider from the Mitesco family. 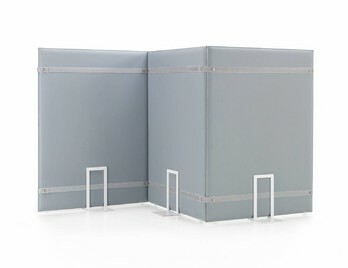 The stand which is available in silver or white can accommodate 3 panels and can be single sided (supporting 3 panels of one side) or double-sided supporting 3 panels either side (6 in total) which is beneficial for sound absorption from both sides of the room. Mitesco Totem is an aesthetically pleasing acoustic vertical feature from the Mitesco family. The Totem can be freestanding and can also be re positioned to wherever they are needed adding visual interest, acoustic relief and some privacy to any interior landscape. The Mitesco panel used on the Totem has the same acoustic properties on both sides. 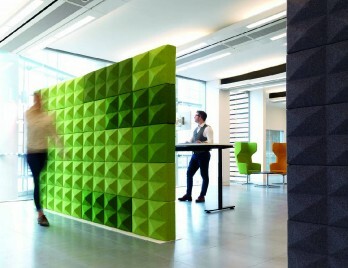 Fabricks is a striking, acoustic, modular brick system made from acoustic foam and wool fabric. 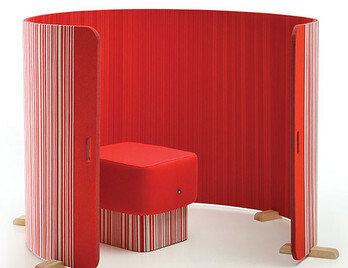 It is designed with geometric aesthetics that divides space and reduces noise to improve the acoustics throughout. Once a Fabricks wall has been created and built it is flexible and lightweight enough to be moved and reconfigured as required, sometimes offering a suitable solution to floor to ceiling walls. With impressive acoustic credentials, Fabricks combats noise levels and visual distractions. 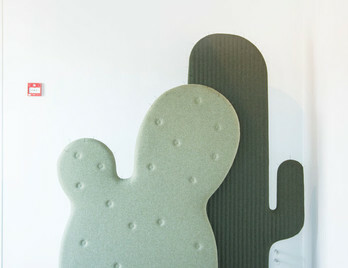 The BuzziCactus is a charming room divider that combines sound absorption with a useful surface that you can stick pins onto. It's playful design and shape injects a fun element into any environment and will very quickly become a statement and a talking point in any home or office. Put your BuzziCactus in direct sunlight - it deserves to be seen! Fresh mountain air would work wonders on office workers, but sadly bringing mountain air into the city would be quite a challenge. We can, however, replicate the ideal by using these wonderful space dividers and acoustical screens inspired by mountainous Machu Picchu, the Inca citadel, set high in the Andes. As BuzzioFrio consists of three panels set closely together the acoustical properties and sound regulation are very effective. Pli Oversize Screen is a sound absorbing screen, made up of a Snowsound panel or panels that can be joined together with elegant and stylish straps with button detail. The bands connect the panels via steel buttons and O-rings that create linear 'T' or 'L' or 'X' configurations. 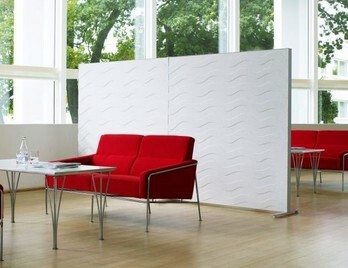 The Pli Oversize panel is an effective room divider and sound barrier due to its large size but easy manoeuvrability. 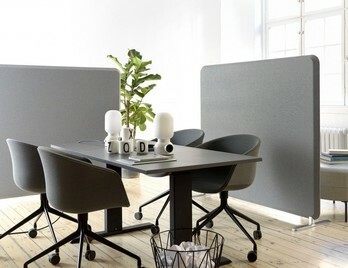 Pli Screen is a sound absorbing screen, made up of a Snowsound panel or panels that can be freestanding or joined together with elegant and stylish straps with button detail. The bands connect the panels via steel buttons and O-rings that create linear 'T' or 'L' or 'X' configurations. The freestanding screen panel is an effective room divider and sound barrier due to its size, manoeuvrability and options to concertina. BuzziTwist is a sound absorbing curved movable flexible screen that takes on a contemporary twist to traditional partitioning. 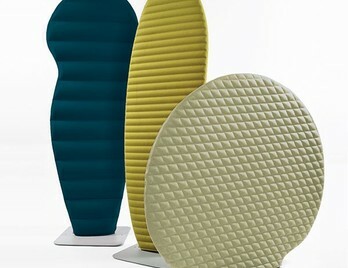 The BuzziTwist is made from sliced BuzziFelt and has fantastic sound absorbing properties. It friendly soft look means BuzziTwist could be used in a variety of environments such as offices, restaurants, maybe quiet zones in libraries in schools and colleges. 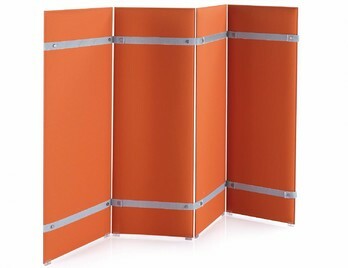 Acoustic freestanding screens are vertical and are usually just below or above head height it means they can also double up as presentation boards and can feature white boards or pinnable surfaces. 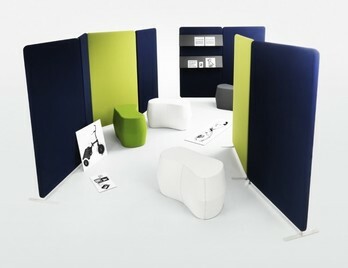 This makes them ideal for creating meeting spaces as each screen or divider can offer a degree of privacy and noise reduction whilst also functioning as a vital focal point for the presentation or meeting. Most acoustic freestanding screens come with a linking device so they can be linked together to form a run or line in order to divide the room or space without gaps or interruption. The linking device usually takes the form of a light grey PVC open channel strip, bonded the edges of the screen. A dumbbell shaped PVC strip which is cut to the same height as the screen is then fed through the top and connects the two screens together. 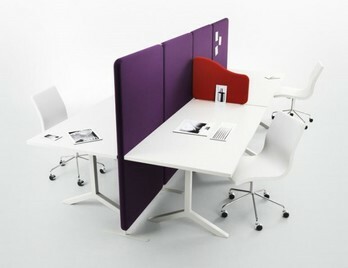 This flexible PVC strip also allows the screen to be positioned at angles allowing the user to create flexible layouts. Acoustic screens have also some interesting and inventive ways of being linked together with Buzzi Space range using zippers to hold and link their screens together. 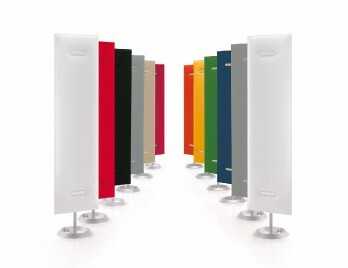 Acoustic office screens or room dividers can be supplied in interesting shapes, some take the form of trees and plants, with the Cactus range from Buzzi Space being particularly eye-catching and adding a colourful playful element to its surroundings. 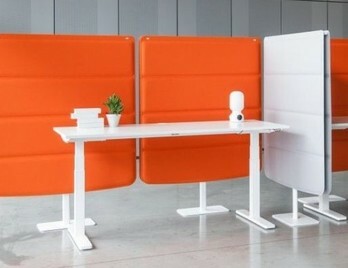 These new types of screens make a welcoming refreshing change to the more the conventional traditional methods of creating spaces or meeting areas within the office environment or workplace.